Summer/Early Fall are best. Winter and spring are snowy. 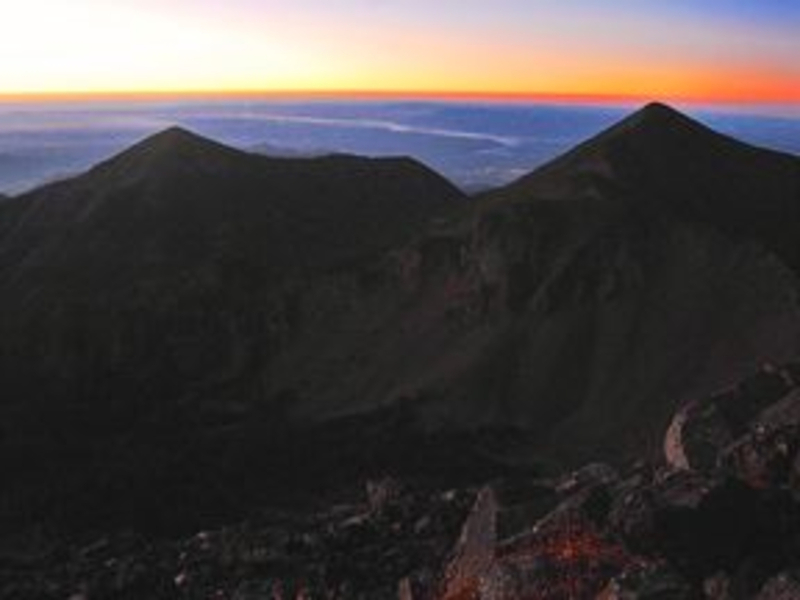 Humphreys Peak is the highest point in the state of Arizona, at 12,633 feet above sea level. From high atop the barren alpine tundra, you can see the lush Inner Basin, Hart Prairie far below, several other volcanic relics dotting the landscape, the uplifted rim of Oak Creek Canyon, and even gaze all the way into the Grand Canyon on a clear day. The trail to get here is a tour of the rugged mountainside, and everything about it seems out of place for Arizona--not at all what you would expect from a state known for desert and cactus. The trail starts from Arizona Snowbowl ski resort, where open meadows afford expansive westward views and a preview of the rugged, treeless terrain high above. Soon the trail ducks into thick aspen and mixed conifer forest and begins to switchback up the slopes. The trail is rocky but not overly steep for most of the distance. You will encounter a few slide paths where avalanches have wiped out all trees and left only boulders. As you climb higher, the forest transitions to subalpine fir, spruce, and bristlecone pine. Bristlecone pines are some of the longest-lived trees on the planet, and the ones up here may be several centuries old. Soon the trail gets rockier and steeper as you approach treeline--the elevation above which most trees cannot grow because the weather is too harsh. The first great reward comes at the Humphreys-Agassiz saddle, where the trail tops out the ridge between these two monstrous peaks and overlooks the Inner Basin falling away into the distant Painted Desert. Many people are satisfied with turning around here, at a breath-taking elevation of 11,800 feet. 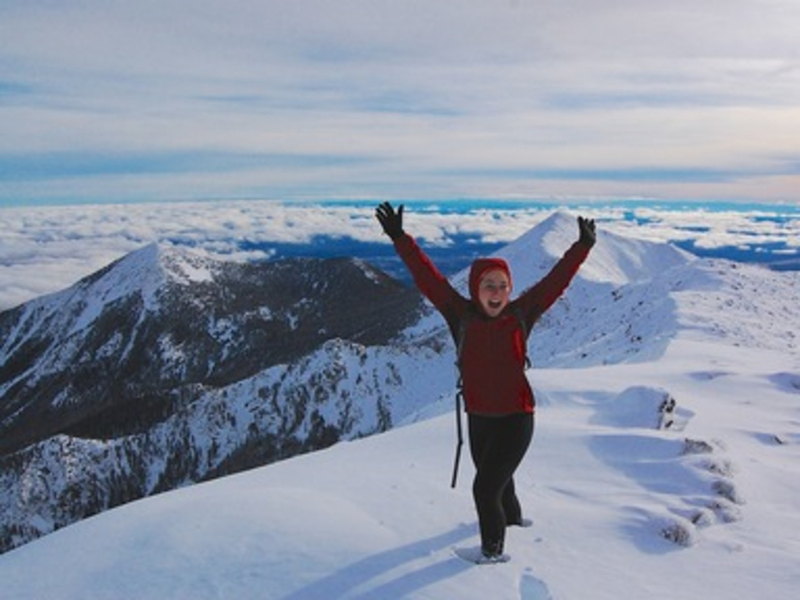 But determined hikers can continue another mile across harsh terrain to reach Humphreys’ summit and stand on the roof of the state. 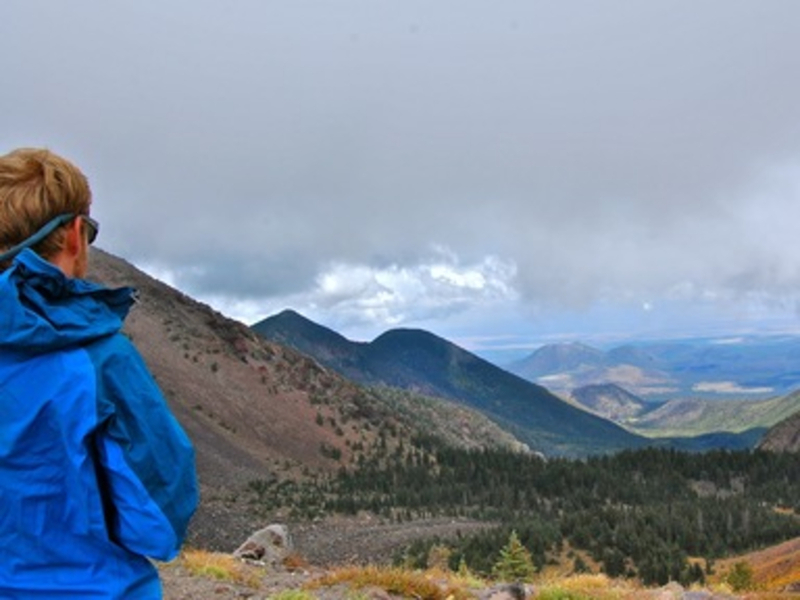 Visitors from far and wide put Humphreys Peak on their list of Arizona destinations, and it is a favorite of locals as well. 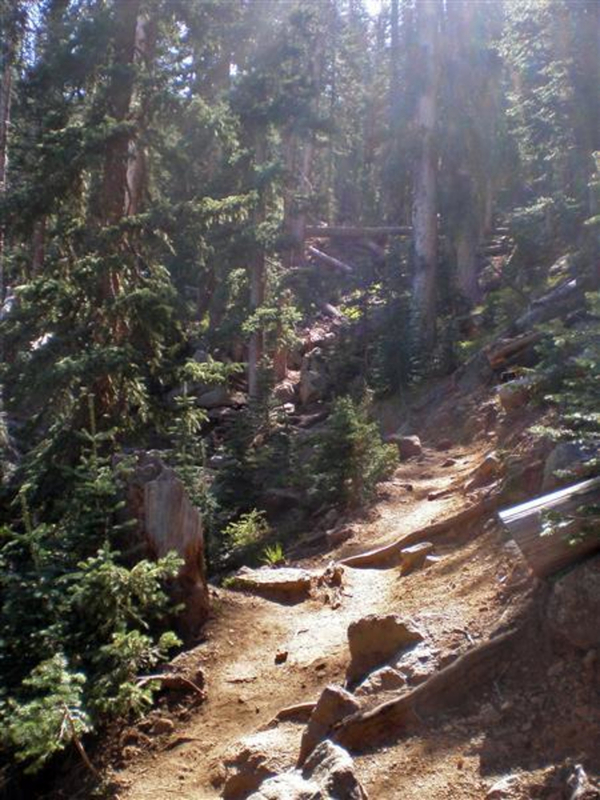 The 5-mile trail is easily accessible by paved road, and the drive is scenic all on its own. Families and dogs can make the hike, but the bouldery terrain up high may be difficult for little ones. This hike is difficult, especially for anyone not accustomed to thin air at high elevation, but well worth it, so pace yourself and come prepared. Snowshoers and skiers can summit during the winter, but winter access requires a backcountry permit, available for free at Arizona Snowbowl or at the Forest Service Flagstaff Ranger Station. No permits or fees are required the rest of the year, but there are several precautions necessary to make an enjoyable and safe trip. First of all, equip for rugged hiking. Sturdy shoes and comfortable clothing are a must, and bring warm layers because the higher elevations can be cold and windy even during the summer. Bring plenty of food and water for the journey, which can take most of the day. Be wary of weather. It can rain, hail, or snow up here at any time of year, and snowpack may linger into early summer. Summer monsoons present particular danger of lightning. These violent storms usually pop up in the afternoon, so try to get up and back down below treeline early in the day. 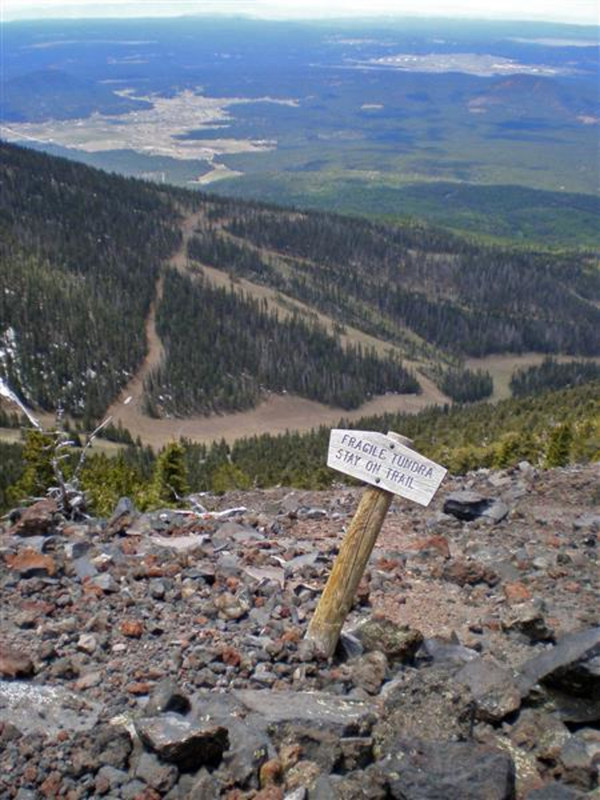 To get to the trail, park in the lowest lot at Arizona Snowbowl and start hiking from the far end of the parking area, near some sign kiosks.